The Pinanski Teaching Prize is awarded annually to members of the Wellesley College faculty to honor fine teaching. The Prize is meant to recognize some particular strength, some style or method or course, or some other describable event that has been especially successful. 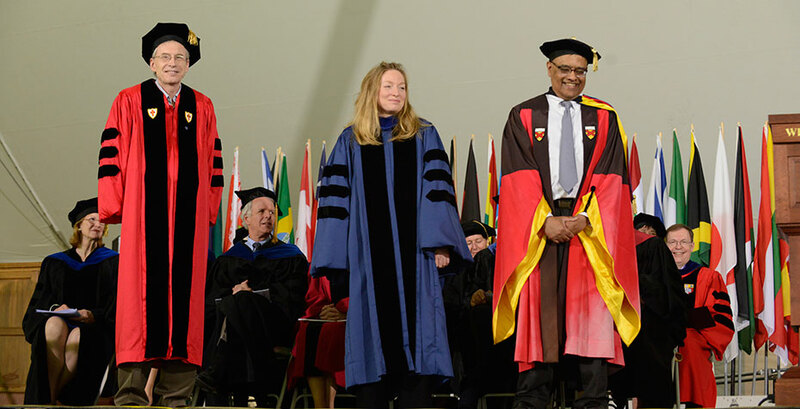 This year's recipients, revealed at Commencement exercises on May 30, are Chris Arumainayagam, professor of chemistry; Kathleen Brogan, associate professor of English; and Joseph Joyce, professor of economics. According to the rules for the prize, the finalists are selected by a student-faculty committee on the basis of nominations from students, faculty, and staff. As President H. Kim Bottomly noted before naming this year's honorees, "Given how outstanding our teaching faculty at Wellesley are, it is very significant to be recognized in this way." Chris Arumainayagam inspires students to be not only better scientists, but better people, compelling them to think deeply about the world around them. Kate Brogan's classroom is a no-judgment zone, a place where students lead the class discussions. Joe Joyce, although the king of the "cold call" in class, is less concerned with a correct answer off the bat than with full engagement of brain and heart. Want to know who has won the Pinanski Prize over the past 30+ years? See the names! Read the citations! Pinanski Prize archives are online.